What Size Is Best for a Birdhouse? Cavity-nesting birds are flexible in their requirements for the preferred size of a birdhouse, but there is more than species preference at stake when planning the appropriate birdhouse dimensions. 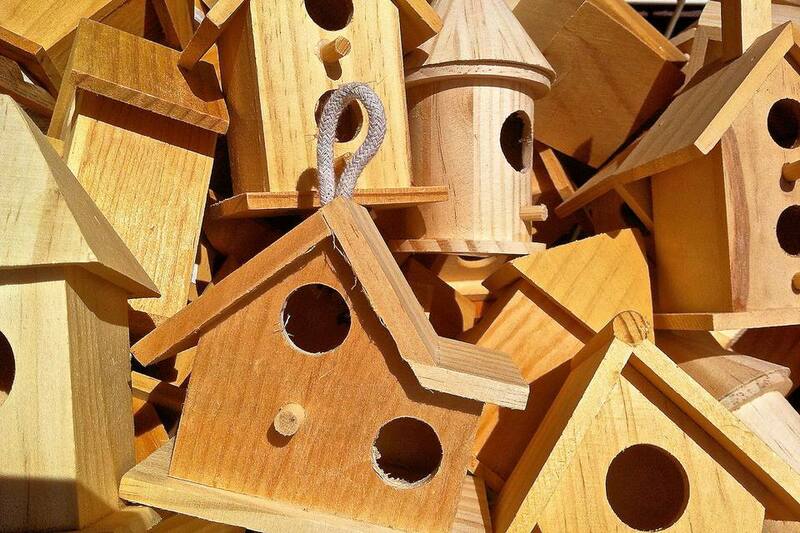 Whether you are building a birdhouse or choosing a new one to purchase, the right dimensions and sizes can make all the difference for safe, comfortable housing for your backyard birds. Adult Size: The birdhouse needs to be large enough to be comfortable for the brooding adults and still provide adequate circulation and ventilation. In addition to interior dimensions, the birdhouse entrance hole size needs to be able to accommodate the movements of the adults birds as they bring food back and forth to their mates and chicks. A house that is too tight can erode the adults' feathers and make them more vulnerable to predators and poor weather. Brood Size: The more eggs a bird typically lays, the larger a base the birdhouse will need to accommodate each egg safely and comfortably, with room for the eggs to be rearranged if needed for proper incubation. Species that only lay a few eggs may use smaller houses, while birds that have larger broods will need houses with larger bases. Fledgling Size: Altricial baby birds, such as most songbirds, can be nearly the size of adults by the time they leave the nest and will need a bigger house to accommodate their growth. Precocial birds, like cavity-nesting waterfowl, however, leave the nest much sooner and will not be as large, so a smaller house size can be acceptable. Safety: The size of a birdhouse directly impacts how safe the house is for both the parents and their chicks. The house must be large enough to accommodate all its residents with proper ventilation for air circulation and temperature control, and the entrance must be positioned at an appropriate distance above the floor to safeguard against predator intrusion. At the same time, a house that is too large may not retain enough heat for healthy eggs and chicks. A larger house could more easily admit birdhouse predators or other unwanted guests as well, and too much room will not help the chicks feel snug and secure. Local Resources: Even if a birdhouse is not the best possible size, birds may still take up residence if the area has abundant food, is safe from predators, and features a good water source. Those resources are critical for raising baby birds successfully, and adult birds will only choose houses in the best possible location, even if the house is not perfectly ideal. When measuring a birdhouse for the proper dimensions, be sure to take into account the thickness of the walls, floor, and ceiling. The dimensions for a safe, comfortable birdhouse are interior measurements, and improper measuring could subtract as much as two inches or more from the overall size of the house, making it much too small to be attractive and useful to the birds. See the table below for the proper interior base, overall interior height, and entrance height measurements for the most common and desirable birds that use birdhouses. Measurements are given in inches. With proper measurements and careful consideration of what makes a house attractive to birds, it is possible to offer the perfect housing for your backyard birds to raise their families. What Birds Will Live in Birdhouses? Building a Birdhouse? Make the Right Size Hole! Is Your Birdhouse Securely Mounted? Are You Ready to Build the Very Best Bird House? Get Building with Free Bird House Plans!